NetEnt, Microgamming, NextGen, ELK, 1x2 Gaming, Iron Dog, Thunderkick, Lightning Box, Chance Interactive, Core Gaming, BET Digital, Blueprint Gaming, Gamevy, Gameslab, Extreme Live Gaming, Scientific Games, Big Time Gaming, Quickspin, Genesis Games, Rabcat, Skillzz Games, 2BY2, Games Warehouse. $From £/$/€10 depending on the method of deposit. 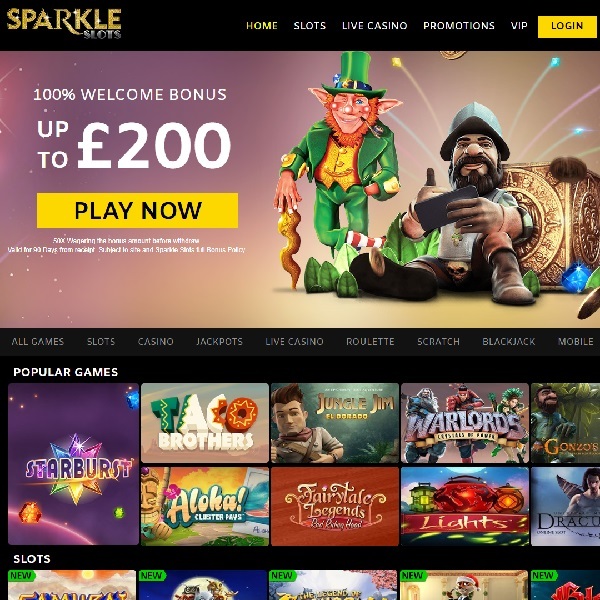 Sparkle Slots Casino is awash with plenty of slots (obviously) but be sure not to neglect the live casino zone (Blackjack, Roulette, Baccarat). Mobile platform is well supported maximizing playing convenience…upping the ante – Sparkle Slots Casino also ensures full support of their live casino section on mobile devices. Just as varied as are their slots…are the varied number of gaming development companies – providing a wide array of titles. This is fast becoming the norm as more sites are packing in as many titles as possible to keep players coming back to get their fill. Naturally new players receive a welcome complimentary bonus and a first deposit bonus of up to £200…additionally there are ongoing promotions on specific slot games which are constantly up for grabs. Repeat players who are enrolled in the loyalty program can start reaping even more rewards at the bronze level and these rewards peak at the diamond level. Stepping into Sparkle Slots Casino world brings with it it’s fair share of generous benefits. On signing up you are immediately entitled to a “Complimentary Bonus,” which a player avails by either choosing the bonus money or the free spins (this bonus must be utilized within 7 days from it being credited to a player’s account). Thereafter the deposit bonus, the “free play” bonuses, happy hour bonuses, weekly surprises are all accessible…even the live casino offers bonuses in forms of cashback (particular attention should be paid when choosing the currency for bonuses, as choosing the incorrect one could null any of the bonuses completely). When it comes to deposit and withdrawal options Sparkle Slots Casino casts the net as wide as possible to guarantee players are never left wanting. The minimum deposit starts at £10 on their Pay by Phone platform, Debit and Credit Cards are easily supported, so is a whole range of E-wallets payment options. The minimum withdrawal depends on the platform but starts at £/$/€20 or 200kr.